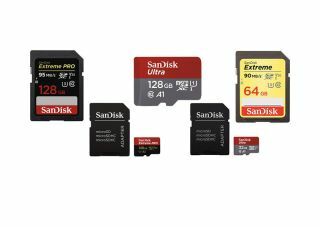 Max out your storage capacity with a fantastic Black Friday price cut on SanDisk memory cards – but act quickly! You can never have too much digital storage available, so why not max out your capacity now that it's Black Friday? We've unearthed a fantastic price cut on SanDisk memory cards – with some reduced by up to 57%! Whatever type of camera you use and whichever image format you favour, there’ll be something for all types of photographer in this sensational deal from Amazon. Act quickly, though, as these prices won’t be around for long – until midnight on Black Friday to be exact. See below for the biggest memory card discounts to catch our eye. Bear in mind that throughout Black Friday and Cyber Monday, Amazon Prime members can instantly access deals like this as soon as they become available. Not a member? You'll have to wait 30 minutes before you can cash in. Make sure you don’t miss out by signing up for a free 30-day trial of Amazon Prime – that way you can jump on the discounts as soon as they go live. Save: £2.47 – With transfer speeds of up to 100MB/s, this memory card is suitable for full HD video recording and playback. There’s a deal available on all sizes in the range, from 8GB up to 400GB. Deal ends: Midnight on 23 November 2018. Deal subject to availability. Need to know more about read and write speeds, memory card formats and video class ratings? Then our handy guide has everything you need to know. But if you know the kind of thing you’re after, then take advantage of this cracking deal – happy shopping.